Mark Dion makes elaborate sculptural installations that investigate how systems of classification, display, exploration, and preservation inform the construction of knowledge, especially where it concerns the natural world. More concerned with how knowledge about nature is ideologically driven than with nature itself, he explores the ways in which institutions help—and sometimes hinder—our understanding of the natural world and our position within it, questioning the authority of those institutions and their conventions. 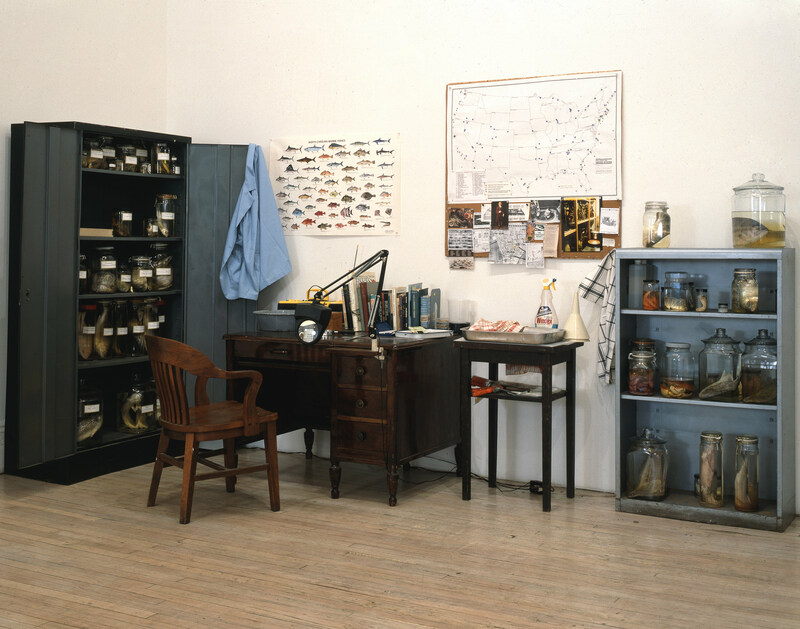 A precisely organized collection of office furniture, storage containers, implements for writing and measuring, maps, and books, The Department of Marine Animal Identification of the City of New York (Chinatown Division) was initially installed and performed in 1992 as one of three works in Dion's exhibition at American Fine Arts, Co., in New York City. Throughout the duration of the exhibition, Dion collected and documented the fish on offer at the markets in the Chinatown neighborhood adjacent to SoHo, where the gallery was situated. "The Department of Marine Animal Identification of the City of New York (Chinatown Division)." Take It or Leave It: Institution, Image, Ideology Digital Archive. Los Angeles: Hammer Museum, 2017. https://​hammer.ucla.edu/​take-it-or-leave-it/​art/​the-department-of-marine-animal-identification-of-the-city-of-new-york-chinatown-division/​.